The Yawhg is a game developed by Damian Sommer and Emily Carroll. It’s been out since May 30, 2013, and is now available on Steam with updated content. 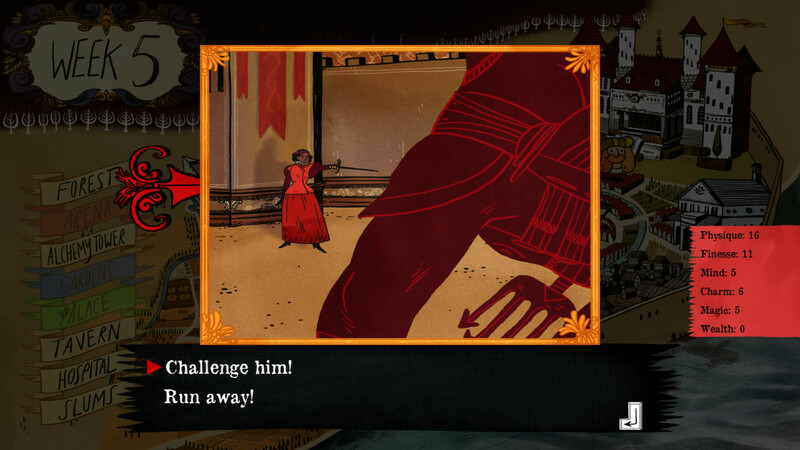 You have six weeks until the fearsome Yawhg arrives – except your characters don’t know that, only you do. The characters are going to live their lives as they normally do, with no idea as to what danger awaits them. I have my own ideas on what the Yawhg might be, and I’m sure you could discover lots of different Yawhg head canons if you talked to other players. Emily Carroll’s artwork is whimsical and does a great job of creating a dissonance between the (mostly) cheerful, day-to-day occurrences of your characters with the sense of impending doom. She illustrates creepy things just as easily, with shadowy monsters lurking in the woods and alleyways. Also, at this point in my reviewing career, I think you guys know that I have a small map obsession, so I was immediately in love with how detailed the city map is. Each place you can go has at least two illustrations associated with it, and no matter who your character is, they are integrated into that illustration smoothly. I think my favorite is when your character does some landscaping in the garden; I’m also partial to the awesomely heroic angle when you decide to fight crime in the slums. I’d also like to mention the awesome character design. The four characters all have different body types, are racially diverse, and are evenly split between the sexes. The women are not wearing skimpy clothes, they do everything the men do (and the men do everything the women do too! ), and I even ran into an encounter with my ex-girlfriend playing as one of the women. I love the amount of representation in The Yawhg. The soundtrack is composed by Ryan Roth (with vocals performed by Halina Heron) and can be listened to and purchased on Bandcamp. It is one of my favorite game soundtracks in recent memory, with slightly ominous folk music setting the tone perfectly. Halina’s vocals are melancholy and evocative of a bard singing legendary tales. There is no voice acting in The Yawhg, which allows for more of a choose-your-own adventure feel (especially if you read out loud when in a group). I’ve played The Yawhg both by myself and with two other people (my sister and a mutual friend of ours). I would have only played by myself, but I was strongly advised to play with others to get the full experience – and I’m really glad I did! First, the solo experience. Even as a single player, you can choose to control up to four characters. I tried it with just one character and with controlling all four. If you pick all four, you’ll have a longer playtime. 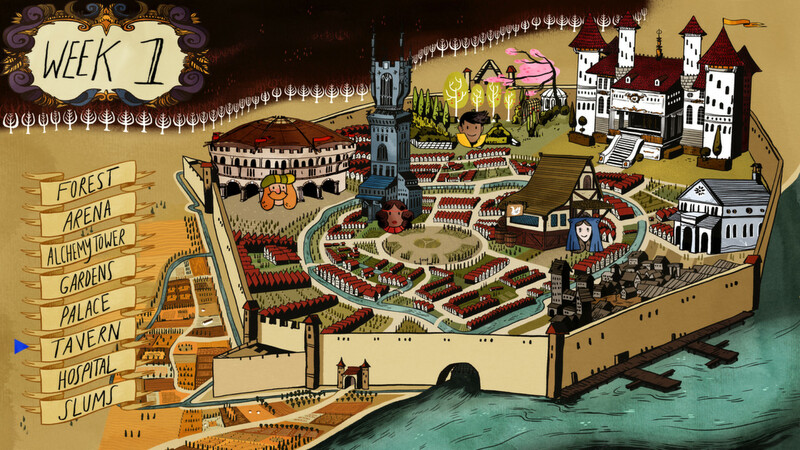 There are six turns in the game, one for each week that the Yawhg approaches. Your character picks one place to go, and then picks from one of two activities. For example, if you go to the forest, you can either hunt or chop wood. Each decision results in gaining stats, and then a random event will happen (like medicinal leeches escaping their containers and terrorizing the hospital). This random event can result in either a gain or loss of stats, and sometimes even result in a problem that occurs throughout the remaining weeks. When the Yawhg finally arrives, there’s an epilogue for each character that is influenced by your stats (and a little bit of luck, I think). Playing with three people was a much funnier and more dynamic experience; seeing how other people shaped their characters and made their decisions was really cool, especially considering that one of them isn’t really a gamer. We each picked one character to control, and working together, we did much better than I did on my own (there’s a message in there…somewhere). We basically didn’t stop laughing the whole time, and it absolutely made me appreciate the game as a whole even more than I did on my own. This is going to be a party game in the future. 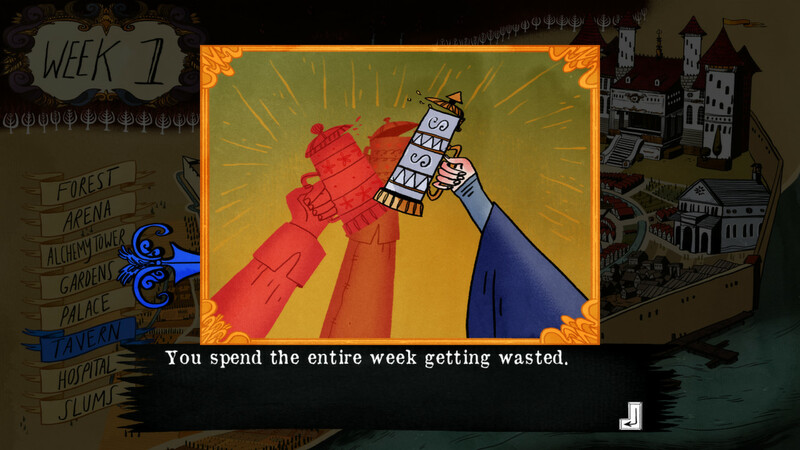 I think the dissonance between the day-to-day life activities and the quickly-approaching Yawhg is an important aspect of the game; trying to blend humor and a sense of unease could easily be poorly executed, but the two elements are balanced perfectly. I don’t want to spoil the endgame, but if I got a less than ideal outcome, I wasn’t discouraged; I wanted to jump right back in and try again. There are so many branches you can find, and I know I’ve only just scratched the surface. 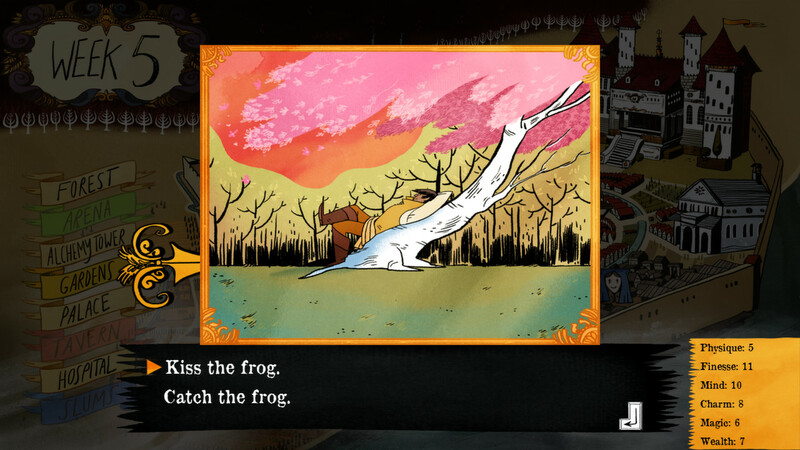 One of my goals is to turn this frog into a prince. Or a princess. Whatever. The Yawhg looks simple at first, but after a few play sessions, its depths become apparent. There’s a ton of replay value here, and it has amazing potential as a party game. Get The Yawhg if you love storytelling, humor, and a vague sense of foreboding. Get the game on the official site or on Steam for $9.99. You can follow Damian and Emily on Twitter.